Cochlear implants have been available in the UK for over 20 years and are the only successful treatment available for people with severe to profound deafness. They can transform lives by restoring an individual’s ability to hear and understand speech or help a deaf person hear for the first time. Pioneering research into the devices at the Institute of Sound and Vibration Research (ISVR) has improved their performance and led to changes in health policy by the UK’s National Institute for Health and Clinical Excellence (NICE). In the UK, ten million people experience hearing loss, 200,000 adults and children with severe or profound deafness may be helped by cochlear implants. While the operations are usually very successful, it is important to continue research into implant technology to improve their sound quality and to learn more about their effectivenes. In 2009, surgeons in Southampton carried out the first operations to implant devices in both cochleas at the same time as routine clinical practice for children receiving implants. Results indicate that bilateral implantation is safe and helps many deaf children achieve maximum benefit from the technology. These advantages have been recognised by NICE which recommended the procedure for all suitable children. But how effective is it to implant two devices? 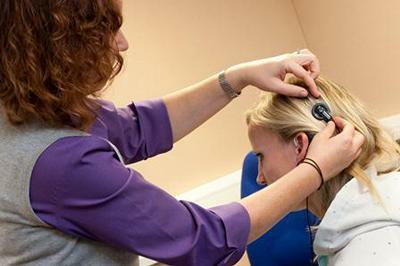 The University of Southampton Auditory Implant Service was appointed to lead the National Paediatric Bilateral Audit to assess the procedure, which has been carried out on 900 children across the country so far, and draw up further guidelines. The University of Southampton Auditory Implant Service (USAIS) was established at the University of Southampton in 1990 to help severely to profoundly deaf adults and children. Since then, surgeons have implanted over 1000 devices. The centre is currently supporting almost 700 adults and 300 children with cochlear implants and more than 200 are using two implants. In 2005 we celebrated 25 years of service. Staff at the centre believe that the treatment of both adults and children by the same team is a great strength. Feedback from adult patients gives staff valuable knowledge for working with young children who may be unable to explain exactly what they hear. It benefits from its close links with ISVR and its high quality research into the next generation of implants. ISVR is renowned for its achievements in the development of cochlear implants. It combines academic research with practical work with patients and has helped more than 800 to regain their hearing so far. Research continues to improve the quality of sound produced by implants. Earlier work by Professor Mark Lutman led to the award of a patent for his ‘sparse representation technology’ in 2009, together with investment from a major implant producer as well as a major European research partnership and grant. USAIS is the lead organisation behind a national audit of bilateral implantation, set up to find out the success of this procedure, three years after its recommendation by NICE. These guidelines were informed by ISVR research and the decision to ask Southampton to carry out this work followed its successful research to determine the best age for children to receive implants. At present, around 11,000 people in the UK use cochlear implants and operations are carried out on another thousand every year. ISVR researchers work tirelessly to improve the performance of the implants and understand how best to use them in adults and children. Researchers at ISVR are also well placed to audit the success of the cochlear implantation programme. John from Basingstoke had an implant after losing his hearing as an adult: “When a person goes deaf after 30 years of hearing you start to withdraw from life, but since the operation and switch-on I have gained enormous self confidence and have really come out of my shell”.